Whenever you see a bumble bee bumbling about its flower of choice, you are witnessing a quiet example of a long and complicated evolutionary process. Over a hundred millions years of interactions between different flowering plants and pollinators have led to an assorted array of unique plant and pollinator species all across the globe. All this plant and pollinator diversity is certainly important to societies today. It formed the foundation needed to create the varieties of fruit and other plant products we know and enjoy. Yet despite all the diversity in pollinator communities, public consciousness of pollination is generally tied to one particular pollinator, the western honey bee (Apis mellifera). Given humans’ long history of honey bee management and their role in our current industrial agricultural system, it makes sense that honey bees receive a large amount of media attention. However, the singular focus on the honey bee belies the important and fascinating role of wild bees in ecosystems and agriculture. The point of this post isn’t to downplay our honey making friends. Honey bees give us quite a lot, but they are just one piece of the immense puzzle that is the overall bee community. In North America alone there are approximately 4000 native wild bee species, but the honey bee is not on that list. Honey bees are native to Eurasia and weren’t a part of the American bee landscape until European colonists introduced them in the 1600s. So, across the vast majority of evolutionary time, North American bees were pollinating and diversifying into different species without honey bees. This led to a large community of bees with numerous differences to our familiar honey bee. One of my favorite differences is that many wild bees do not have stingers (making them much easier to deal with! ), but there are certainly others. For instance, the vast majority of North American bees does not live in colonies and therefore have no queen. Whereas honey bees form large colonies with one single reproductive female queen and thousands of infertile female workers (called “eusocial” colonies), wild bee species display a dizzying variety of sexual and social behaviors. On the more antisocial side of the spectrum, females of the wool carder bee, Anthidium manicatum, live solitary lifestyles after mating. Once the females make their individual nests and mate, they collect pollen specifically for their own offspring. Male wool carder bees also tend to be very territorial, tending to tussle with trespassing males and other bee species in attempts to keep flowers to themselves. 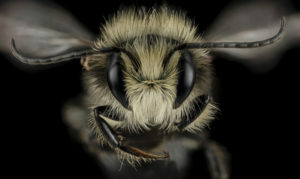 Here’s a neat video showing the wool carder bee throwing its weight around (https://vimeo.com/129712987#t=2m50s). Some wild bees, like the blue orchard bee, Osmia lignaria, can form large groups of solitary nests, never really working with their neighbors but tolerating their close proximity (often because of limited suitable nesting spots). 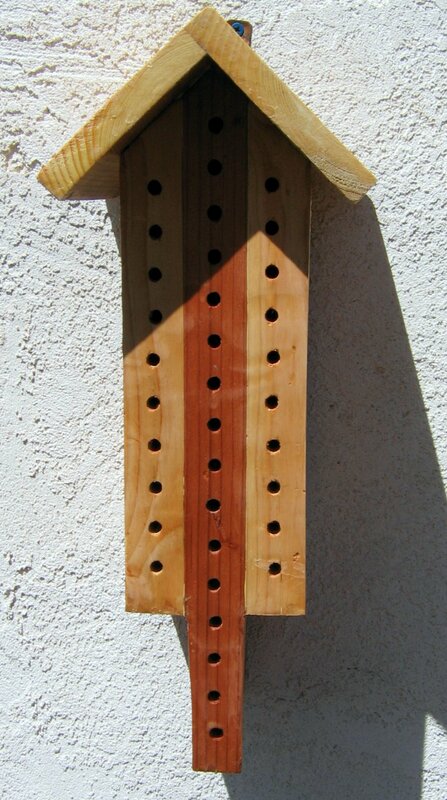 You can even give these bees artificial nesting spaces, called bee houses, and they’ll take up residence. Still other species, like Perdita texana and Lasioglossum hemichalceum then use these large clusters of individual nests to create what effectively becomes a bee cooperative housing unit. Despite all females having their own young to provide for, these bees will seemingly share foraging and/or nest maintenance duties among themselves. This means one individual may build and/or stand guard while another takes their turn to forage for provisions for their young. Living in these smaller individual nests means that North American wild bees are able to use a variety of nesting strategies that wouldn’t work for the large honey bee hives. While honey bees are builders of sizeable hives, other bees live as miners, carpenters, masons, etc. Many species mine into loose top soil in the ground, digging a relatively shallow nest with a few compartments for individual larvae and living. Other species, like the comparatively huge carpenter bee Xylocopa virginica live similarly by burrowing into old logs, wooden fencing, or even telephone poles. X. virginica’s size can sometimes make their burrowing a nuisance, but most carpenter bees are small enough that people never notice them. Beyond having access to unique living options, many wild bees are also able engage in different types of pollinating behavior unique to their species. One of the most important talents that eludes honey bees is the ability to ‘buzz pollinate.’ While this has been discussed before on Thought and Awe, it’s definitely worth another look. Certain species of flowers (such as tomatoes, egg plants, and potatoes) only release their pollen when their flowers are shaken at an exact frequency. While honey bees are unable to match these frequencies, bees like bumble bees and bees in the Agapostemon genus are able to flutter their wing muscles at just the right speeds in order to release pollen and successfully pollinate these plants. There are even species of North American bees that can pollinate during the night. 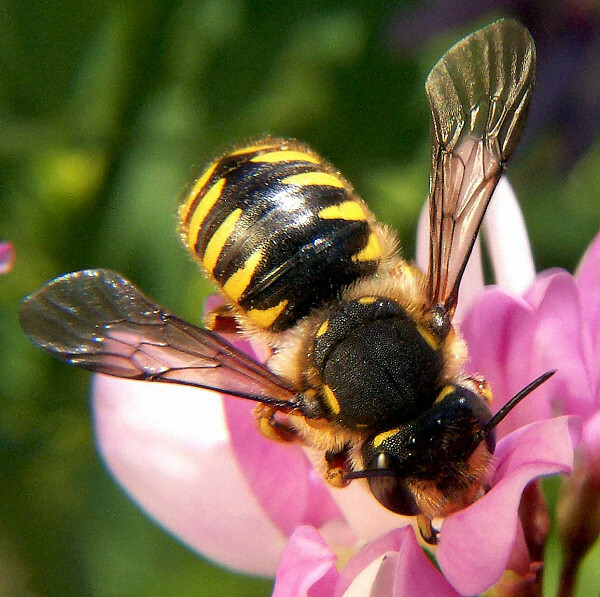 All bees rely on reflected UV sunlight from petals in order to find flowers. This means that most bees, honey bees included, are limited to day time foraging while the sun is out and shining. However, certain species of the genus Lasioglossum have extra-large top eyes, called occeli, that function like night vision googles. 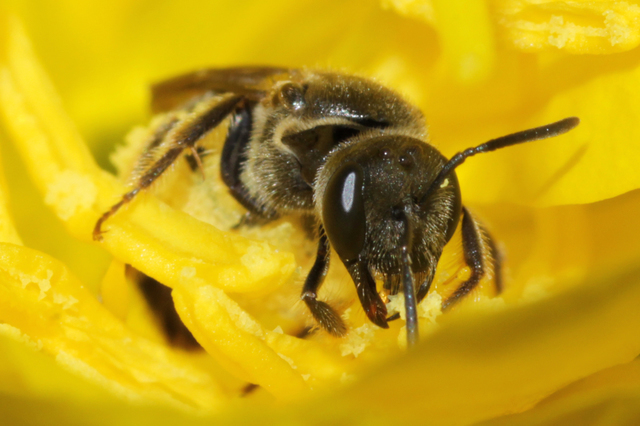 While all bees have occeli, certain Lasioglossum species have such large occeli that they can use even the reduced light coming off the moon to find late-blooming evening primrose flowers sometimes hours after sunset. In addition to these specific pollinating abilities, wild bees have co-evolved their own preferences and specializations with wild flowering plants that honey bees either ignore or can’t pollinate. Since pollination is crucial to plant reproduction, wild bees support the variety of plant species that form the very basis of our ecosystem. As you might expect, as wild bee populations decrease, researchers are finding correlated declines in the abundance of insect pollinated plants and the amount of unique pollinator interactions between bees and plants . Researchers are also uncovering increasing evidence of the important role that wild bees play in our agricultural systems. In certain crops, like sunflowers, wild unmanaged bees can work synergistically with honey bees, pollinating more efficiently together than either group could do alone. This occurs when wild bees occupy sunflowers, causing honey bees to frequently move between flowers looking for unoccupied flowers. This causes honey bees to have a higher change of moving male pollen to female flowers for successful pollination events. In numerous other crops, wild insect pollinators (including some non-bees, like butterflies) were able to nearly double fruit yield when compared to honey bees. It’s no surprise then, that the latest estimates put the economic impact of wild bees to the US agricultural GDP at a minimum of $3.07 billion. That doesn’t even include the added value wild bees provide via unmeasured pollination in backyard gardens or the pleasant aesthetics of beautiful flowers. This economic impact also seems to be increasing given the growing demand for specialty fruits and vegetables which benefit from wild bee pollination, such as avocados, various nuts, passion fruit, and squashes. 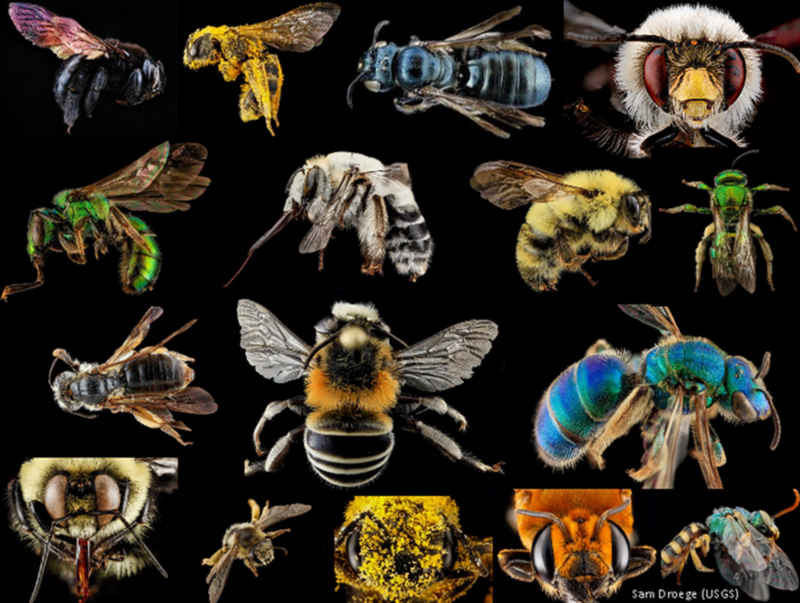 This delightful diversity in wild bees helps sustain the green planet that we call home. While honey bees are certainly an important piece of the pollination puzzle, let’s put wild bees in their rightful place next to honey bees in the pollinator pantheon. Editor’s note: While we’ve delved into the intricate diversity of pollination from the side of the pollinators themselves, there’s just as much complexity on the plant side of the interaction. If you can’t get enough of the wide world of pollination, I’d urge you to check out the Thought and Awe article on the wild ways orchid flowers get their share of the pollinator pie. These are all over North America now, but originally come from Europe.